Various rules have been laid down for determining the rise and going of steps, with the object of securing each of the correct proportions. They are governed by the theory that the energy required for climbing is twice that required for travelling on the level. The average stride is taken as 24 inches, and the most general rule therefore states that rise x 2 + going = 24. This gives 6 1/2-inch risers for 11-inch treads, although frequently in practice 6 inches and 11 inches are used, giving an easy-going stair. Where the rise is increased the going must be proportionately reduced, but it is not advisable to exceed 7 1/2 inches for rise or 12 inches for going, - of course, in each case maintaining the above proportion. When the rise and going of stairs has been determined a pitch board is cut, and with this the strings are set out. In the case of a string where there are winders, one board is seldom of sufficient width at the part where winders occur. It is then widened in the manner shown in Fig. 160, in order to cut the "easing" of the string. The pieces are groove-and-tongue jointed on. The "Nosing line" being marked on at the required depth of the margin, a thin strip of wood having a straight edge is temporarily tacked to this line, and along this the pitch board is run, the steps being marked with a knife cut. The housings are marked at the same time by means of small wedge-shaped templates. The several ways of connecting up the steps are shown in Fig. 161. That shown at A is the wrong method of tonguing the riser into the tread above. B is the correct method when they are tongued, and C the usual method. In this the riser is not tongued, the scotia is grooved into the tread, and the riser fits into the angle. The projection of the nosing is usually equal to the thickness of tread. The method, of fixing the bottom of riser to tread shown at A is bad. It is sometimes used in common work to save jointing treads. B is the usual and correct method, and C is an excellent way preferred by many. Here the tread is screwed to the riser, which it slightly overhangs, slots being made for the screws, so that in case of shrinkage a little movement may take place without starting any joints. Small angle blocks are glued as shown in the angle between the tread and riser, spaced a few inches apart. Steps are built up on what is called a "Cradle," which is really a guide, to enable them to be turned out square and true. 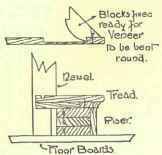 The tread is placed on the cradle, the small strip which is to form the scotia is glued and fixed in the groove in tread, the riser is glued and pressed up against the strip, the angle blocks then glued behind, and, when sufficiently set to handle carefully, the steps are stacked on an even surface to dry. The nosings and scotias are worked afterwards. Fig. 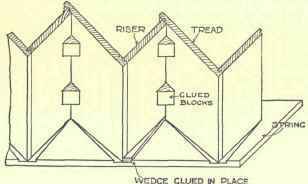 162 is a sketch of a small portion of the Planceer looking upwards, showing the housings in string, and the method of wedging the steps in same. The wedges are shown dotted, and are generally wider than the depth of housing and project slightly above the string. Housings are made from 3/8 to 1/2 inch in depth, and allowance must be made in the length of steps for twice the housing in addition to the nett width of stairs. 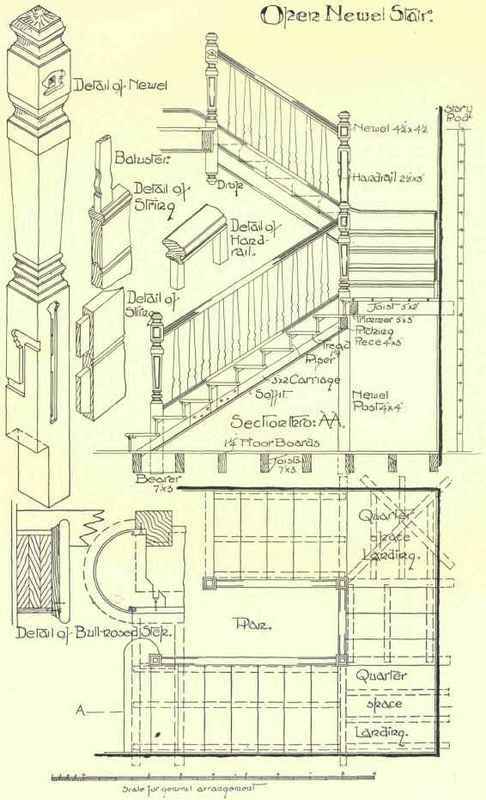 It is usual to construct the bottom step of stairs with some ornamental finish, in the shape of either bull-nose or curtail ends or commode front. Frequently a combination of the two latter is adopted, and also the first few steps of the flight, in addition to the bottom one, may be formed with commode fronts, especially in the case of a shop or public building, where the lower portion of the flight stands independently. There are two methods of forming a bull-nose end to a step, one wrong and the other right. The former is always adopted in common work, but is seldom practised by any self-respecting joiner. It is shown in Fig. 163, and consists in making a number of saw cuts or "kerfs," as they are technically called, across the riser to within about 1/8 of an inch of the face and then bending the riser as required. The kerfs are exaggerated in the illustration to show the principle. An easy or quick sweep can be made in this way by putting few or many kerfs, but it can be readily seen that a true curve is not obtained, but merely a number of narrow straight faces. The proper method is shown in Fig. 164. 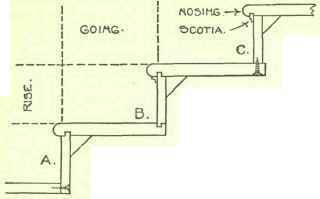 In this case a foundation for the curve is made by building up a block of several pieces to the required thickness, glueing and screwing them together and shaping as shown in plan, one notch, that nearest the newel, being undercut. The riser is then marked from this, and the back cut out leaving a veneer face, a little extra being allowed for wedges. When ready, the veneer is well wetted with boiling water, glued, bent round the block and wedged with folding wedges, the ends of the block being subsequently screwed to riser. 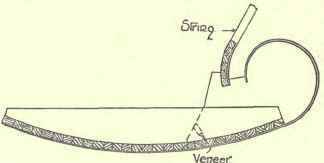 A curtail step is formed in much the same way, a block being prepared to the proper curve, and the riser veneered and bent round as shown in Fig. 165. When the lower portion of a string is also curved it should be treated as shown. Commode steps are sometimes formed by kerfing the whole riser, and bending it to the sweep required, but this merits the same remarks as those applied to the similar manner of forming bull-nose ends. The correct way is shown in Fig. 165, and consists in cutting two ribs struck from the same centre as the required curve, but with 1 1/4 inch less radius, and nailing on narrow pieces of 1 inch stuff after the manner of a close lagged centre. The curve is then worked true and the front veneered on.